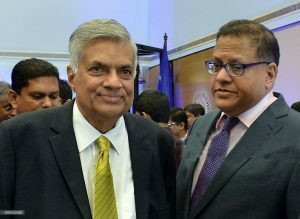 According to sources the Speed Post Courier Service has informed the CID that former Governor of Central Bank of Sri Lanka Arjun Mahendran is not at the address he has given. This has been revealed when an attempt was made to hand over to Arjun Mahendran, through Speed Post Courier Service, the order given by Fort Magistrate Ms. Lanka Jayaratna for him to make a statement to CID. This was the second time an order was made for him to come to Sri Lanka and make a statement to the CID. Court had ordered that the notice that includes Magistrate’s order in English should be handed over to Arjun Mahendran at his given address at 201 Cuscaden road. # 18-1 The Tomlinson, Singapore 2497726. However, the Courier Service has informed that Arjun Mahendran ws not at the given address.